This unique shower sponge has a bendable handle - just use hair dryer to set the handle curve you want. To straighten again or change the shape just re-heat and bend. 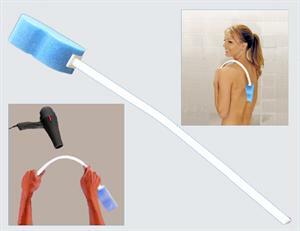 The long bendable handle makes it easier to reach your back, wash your feet, and more. Sponge is latex free with an hourglass shape for comfortable coverage. Extra-wide ergonomic I-beam design handle for secure grip when wet.